Our little much-anticipated Westmeath break began with us pulling up to a house we weren’t sure we were meant to be in along with lots of resident animals circling the car as we discussed our options. As Special Gentleman went to investigate whether we had arrived or were trespassing he warned me that the ginger cat that I was being nice to was going to try to jump in the car. ‘It never would’ I declared at which point he did a duck and a dive along with a shimmy by my calves (legs – we didn’t have any other animals in the car at the time) followed by a bite of my knuckle when I tried to apologise for my lack of hospitality. Well isn’t this just going to be the funnest staycation ever? Finally we found somebody to show us around. We’re pretty sure she didn’t work there but she knew the area so we went with it. At least if we were trespassing there were 3 of us in it now. Plus she had a child. Always do your crimes with a child in tow. They’re better than machetes when it comes to discouraging curious do-gooders. 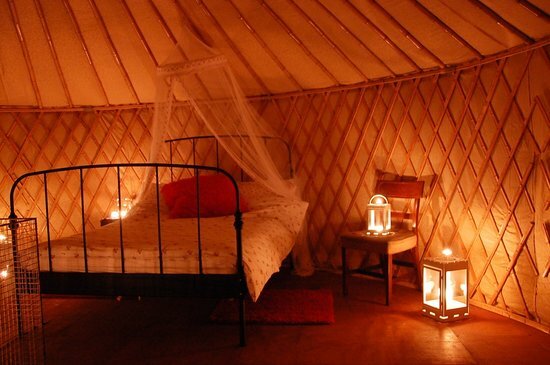 After a brief little tour of the area we were shown to our Yurt. It was at this stage I came to fully realise that we were indeed camping. Oh I knew we’d be in a tent but I just forgot about a few little details. Such as electricty… none. Private bathroom – nope. Locks on doors – nada. Lights to guide our way in the dark – diddly. Special Gentleman was excitedly identifying what we did have: Farm animals – lots! Candles – plenty. Fire wood – ooooh sticks. And a shared toilet … in lovely wood ‘with a Vintage feel to it’ I was told. I then began to wonder what exactly we were going to do here for two days. Right, back in the car to find alcohol and cards. If our private picnic table was to be our location for the next 2 days by George I’d have provisions. As we drove in to Mullingar in apparent escape of our ‘escape’ my mind wandered to unsent emails, unticked ‘to-dos’ and unmade phone calls. Imagine how much work I could have gotten done already with no commitments…. wind down was not instantaneous. After killing some time in the bookshops and supermarkets of Mullingar we went to a local pub were we drank Guinness and played pool. And breath. Aaaaaaah. What is it about pool that makes you feel like you’re on a proper weekend away in Ireland?? Well it does and I’m not sure whether it was the game or the drink but finally I began to chill and not long after I was relishing the time away from Dublin. All I cared about now was which window menu to read first on the High St. By the time we got back to our Yurt it was getting dark and chilly so we lit our little (very little – much more little than photos had led us to believe – too little to warm the place up surely) fire. At the same time we lit all of the candles in the place and suddenly the Yurt was a much lovelier prospect than in the harsh light of just-arrived-from-Dublin day. Once we had lit every candle in the place (the Yurt is big by the way – two double beds and room for two more so plenty of candles around the place) and delighted in the ambience of it all we remembered that we were going straight back out again and so spent the next few minutes blowing out each of said candles. We left the fire lit and willed it to warm our little home up. The heatwave had not yet arrived – rain and chill were still standard last week. Off to the local we took ourselves where we planned for a closing time finishing time. As we opened the door of The Drake Inn we were hit with a wall of heat that felt like heaven and we sat ourselves directly in front of the source – the most wonderful turf fire we had ever seen we agreed. By the time the Guinness was ready we’d moved 3 tables down to try and cool down. Wonderful we agreed, but quite unbearable. Actually moving around this pub is quite a good idea so you can take in all of the memorabilia (no theme just general posts), letters, notices and photos, our particular favourite of a Donkey standing at our very table drinking a pint of the black stuff. I kid you not. This I could happily make my local. Unfortunately due to the force of the fire we were wiped out with tiredness by the end of our first drinks and took ourselves home with our tails between our difficult-to-see legs. Thankfully Special Gentleman had remembered the head torch that was our constant companion at Burning Man last year because otherwise I fear we would have curled up on the doorstep of the main house for the night. The walk was quite literally pitch dark. Every noise had me jumping and imploring ‘what’s that? !’ ‘Your shadow’ came the quite matter of fact response. The night was punctuated with a chatty owl and the following morning we were woken by all sorts of animal activity. It was actually pretty brilliant. We got ourselves off to Mullingar again for a gorgeous brunch and then took our trainer wearing, camera yielding, American tourist looking selves off to the Tourist Office to find out what to do. Although a very helpful girl gave us lots of information that we nodded to enthusiastically we actually remembered practically nothing of it by the time we got to the car and decided on a drive toward a general area on the map. A drive. With no real destination. We have become our parents. Relatively soon into the drive we came across a diversion. We couldn’t figure out what it was due to or what was happening because, as is so often the case at these diversion points, there were a bunch of men just shooting the breeze and taking in passing, u-turning traffic. We pondered our route and decided to just pull up beside the diversion and have a mooch in the intriguing shop on the corner of the road. Antiques and Curios! I was delighted with myself and skipped pass all of the garden folk that were displayed outside only to find a locked door. And an unanswered bell. Both left me slightly deflated. Until, that was, I revisited the garden folk. To say we got a good half hour of entertainment from them is probably an understatement. In fact I do believe they may have been a Westmeath highlight. The day continued in a similar manner: stopping at any, often random, place that would take our fancy and chatting to anyone, generally retired folk, that would talk to us. In Multyfarnham: The Friary! Mostly because of …. The Holy Water! Maybe it’s only us but we just weren’t expecting it to come in barrels! Ok so we saw very little of the gardens but what we did find was the most charming tearooms with a proud new owner and unreal Apple Pie. We were most enamored with the second section of the rooms where old stables had been converted into three different snugs. I spent my cuppa between the three of them imagining Mr. Ed recently hanging out in each. Apparently the castle is one of only two castles in Ireland where the original family still live. I didn’t actually think anyone lived in castles but my imagination went all Downton Abbey at the thoughts so the discovery of their transport iced the very posh cake nicely. Lessons on how and when to use the carriage. Mostly advising to stay at home! 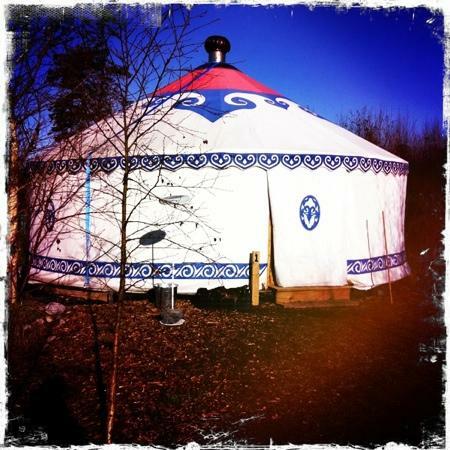 And with fresh eyes and enthusiasm we revisited our surroundings and explored our Yurts surroundings. And then it was time to go… and not a game of Switch played the whole weekend.